A support group can mean different things to different people. For some, it is a place to talk, for others, a place to listen. It is both a place to share your experiences, and to learn from the experiences of others. Most importantly, it really is fundamentally about support! Support groups are all about the emotional and physical support that comes from a community going through the same things you are. Forming a support group is a wonderful way to create a community that is inclusive, accepting, and that helps its members manage and live their condition together. What if there isn’t a Support Group near me? Say something about the online chat here!!!!!!!!!!!!! Molly’s Fund offers two local lupus support groups in Portland, Oregon. One support group is for lupus patients, and the other is for family, friends, and caregivers of those with lupus. Both meetings are at the same time and location in different rooms. The Louisville Patient Support Group is run by two wonderful volunteers, Ellasha and Valeciea. Our newest support group! Welcome Afton!! 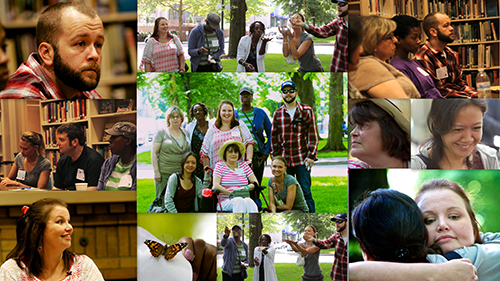 A photo collage of one of our support group meetings here in Portland, and a very special day this spring where we released butterflies! Don't live in the Portland, Oregon area but would like to participate in the conversation? Need support or an understanding ear? Come by our online support group!